It was Airbus SE and clothing designer Burberry Group Plc last week. Rarely a day passes in Britain without another corporate warning about the perils of leaving the European Union without an agreement. While the focus has been on trade with the EU, the problem is that what’s become known as a “no-deal Brexit” might be just as bad for companies doing business with other parts of world. And executives and policymakers say there’s little they can do to prepare. Politicians in London are seemingly at an intractable impasse, and the U.K.’s failure to guarantee free-trade agreements with countries like South Korea, Turkey and Norway has left exporters and importers concerned they too will be cut adrift. About 11 per cent of Britain’s trade is currently covered by deals struck by the EU for its member states, ones the UK will have to replicate to maintain unencumbered exports and imports to and from more than 30 countries. After more than two years of limbo, Britain is confronting the prospect of customs barriers leading to shortages of everything from medical supplies to manufacturing components. Liam Fox, the minister in charge of international trade, said this month that the major deals would be rolled over before leaving the EU on March 29, but others wouldn’t. At Lye Cross Farm, a cheese producer in southern England, it’s hard to know how to prepare because so much is undecided, said Peter Alvis, the managing director. The business exports about £1.5 million ($2 million) of extra mature and vintage cheddar each year to Canada, which has a trade accord with the EU. The UK trades with dozens of countries via agreements it has through the EU. They will no longer be valid if Britain is forced to revert to World Trade Organisation rules once it leaves the bloc. UK exporters would be subject to tariffs. It’s a long way from the nostalgic mantras of the pro-Brexit campaign of a former imperial giant breaking out of the shackles of EU membership to strike out in the world again, and indeed assurances that rolling over third-country trade deals would be simple. Bloomberg Economics’s Dan Hanson estimates a free-trade agreement with the US would make up less than 15 per cent of the economic hit to Britain from a no-deal Brexit. Accords with a group of countries from the old British Empire, including Canada, would make up only about 13 per cent. Parliament is due to vote on a new strategy for Brexit on January 29, but May is unlikely to come back with something that would immediately end the deadlock following last week’s record defeat in a House of Commons vote. Meanwhile, the chorus of doomsayers grows louder. Airbus, which makes wings for commercial aircraft in Britain, said on Thursday it might be forced to move future investments elsewhere in the event of a no-deal divorce. At the World Economic Forum in Davos, Bank of England Governor Mark Carney said UK businesses are “limited” in what they can do to prepare for logistical delays. Trutex, a school uniform retailer based in Lancashire, northwest England, imports the vast majority of its garments from countries like Bangladesh and Sri Lanka duty-free through EU agreements. Those imports could be subject to 12 per cent tariffs if free-trade deals cease to be in place for the UK, said Matthew Easter, Trutex’s managing director. The five biggest of the agreements that need rolling over should be in place come Brexit day, according to Fox, the government’s trade secretary. He said on Wednesday he’s agreed “in principle” to roll over the existing EU-Israel agreement. One with Switzerland will be signed in the coming weeks, he told BBC television earlier this month. Some firms are sceptical that there’ll be any immediate changes and expect that any disruption will be minimal. 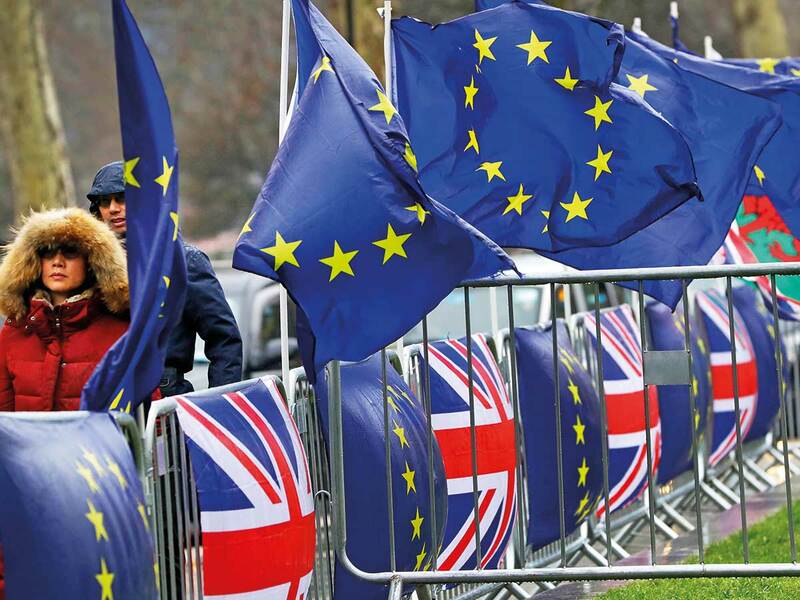 Realistically, the UK government could at most agree “patch-up” accords with the third countries by Brexit day before turning to more long-term negotiations, according to Alan Winters, director of the UK Trade Policy Observatory in the University of Sussex. There could be issues with rules of origin when the UK tries to renegotiate these deals, according to the observatory. Free-trade agreements require a certain proportion of inputs to originate from the exporting country. Right now, EU and UK inputs are usually interchangeable. After Brexit, if parties can’t agree on a similar set of rules companies could have to skew supply chains toward domestic production to conform to the new ones. Countries are also likely to take advantage of the U.K.’s weakened bargaining position once it quits the largest trading bloc in the world.